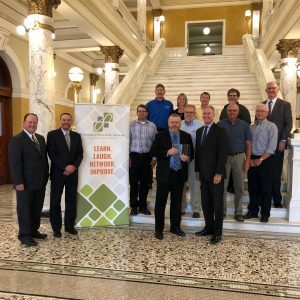 PIERRE, SD, July 16, 2018 – At a celebration hosted by Governor Dennis Daugaard at the Capitol, the Performance Excellence Network (PEN) today honors the South Dakota Department of Transportation (SDDOT) with the 2017 Performance Excellence Award. The Award is based on the Baldrige Framework and is the culmination of a rigorous evaluation of an organization’s management and performance system. The evaluation criteria consider leadership, strategic planning, customer-related processes, measurement and knowledge management, workforce, and operations, and recognize organizations that are systematically improving results. 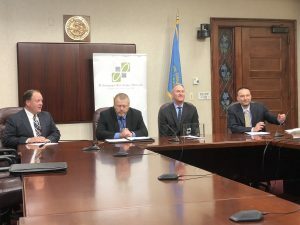 Baldrige is a 30-year-old federal agency managed by the U.S. Department of Commerce and exists to facilitate continuous improvement and performance excellence throughout the country; PEN is the regional Baldrige-based program serving organizations in South Dakota, North Dakota, and Minnesota. All types of organizations – businesses, hospitals, schools, nonprofits, and governmental agencies – use the Baldrige Framework to identify and prioritize improvement opportunities, focus energy, optimize resources, and improve outcomes. The SDDOT receives the “Advancement Level” of recognition, which is the second of four levels given by PEN. There have been 138 organizations recognized since 1991 by PEN program. The DOT is the third in South Dakota (Avera Sacred Heart Yankton, 2011, and SD National Guard, 2014 and 2016). The SDDOT was also recognized at PEN’s annual conference in the Twin Cities last May. Two other organizations receiving recognition this year were LifeSource (South Dakota’s nonprofit organ procurement organization) and Cardinal of Minnesota (a Rochester, MN-based business that manages group homes for adults with developmental disabilities). Founded in 1987, the Performance Excellence Network (PEN), advances continuous improvement and performance excellence within organizations, individuals and communities in a three state region: South Dakota, North Dakota, and Minnesota. PEN helps leaders identify strengths and improvement opportunities, and it builds networks that bring information, resources, knowledge and best practices to organizations desiring to improve. PEN serves over 250 members and organizations in the Upper Midwest – businesses, healthcare systems, educational institutions, nonprofits, and governmental agencies. For more information, go to http://www.performanceexcellencenetwork.org.